Gusto – something that goes like a gust of wind – quiet, smooth and refined. 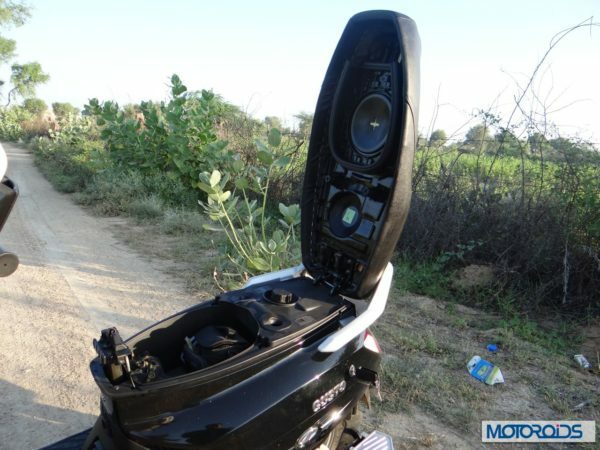 That’s what the two wheeler arm of the Indian tractor, UV and SUV giant, Mahindra Two-Wheelers, planned and executed when it developed its latest scooter on the block, the new Gusto. We lay emphasis on the word “new” because Mahindra Two Wheelers have developed the Gusto from ground up. 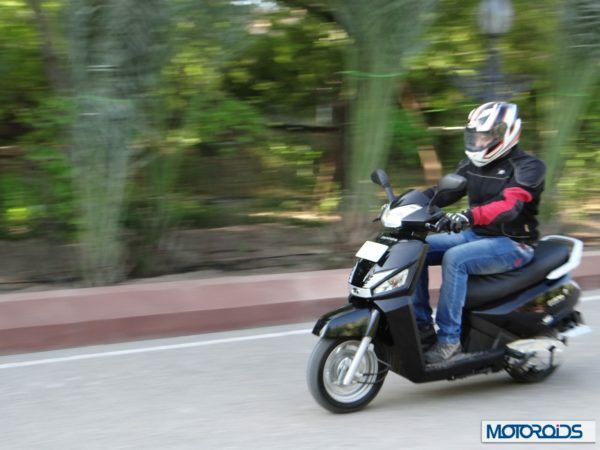 The Gusto is based on an all new platform, sports new bodywork, dons a newly developed all aluminium M-TEC engine and comes loaded with a slew of first in segment features. Frankly speaking, after going through dozens of spy images, I didn’t have great expectations from the G101 (what it was called before the official name was announced). I expected it to be a regular 110cc scooter with a little bit of styling change. But my perception was challenged after PS Ashok, Senior Vice President and Head of R&D and Pune Operations started explaining the effort that the team at Mahindra Two Wheelers had put in to develop this scooter from ground up. And when I say effort, I mean some serious research and conviction towards the audience to present a product that would have a better utility value than many other scooters in the market. But did my perceptions actually change after the ride? let’s find out through this exhaustive review. In terms of styling, the Gusto, in many ways, is inspired by Mahindra’s SUVs. 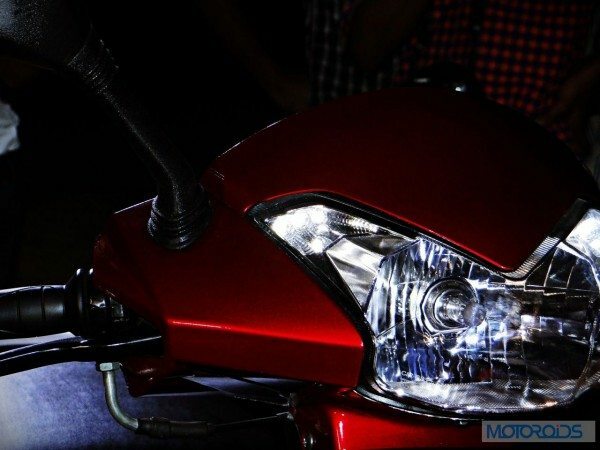 The headlight receives a ‘M’ style top edge while the bottom is curved. The pilot lamps, placed on the top- left and right corners, are LED units while the headlight is a halogen lamp that provides optimum illumination at night. Similar to Mahindra’s new SUV, the Scorpio, a first-in-class ‘Guide Lamps’ headlight comes as standard. 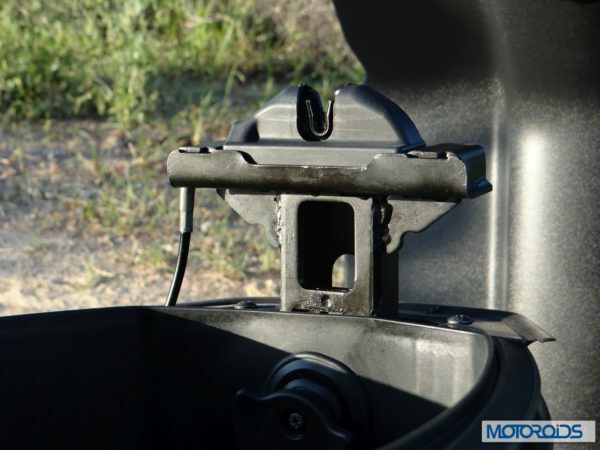 The function of the Guide Lamp headlight is to provide illumination even after the ignition is turned off and the key has been removed. The headlight remains ON for about 10 seconds which really comes handy while getting out of a dark alley or parking space. The front apron houses the turn indicators with black plastic corners. A Mahindra logo sits at the bottom centre of the apron right between the turn indicators. The creases placed behind the front number plate have a 3D look which is a very neat and tidy job. The silver coloured plastic faux fins add to the character, however, aren’t of much utility for the Gusto. In fact, we feel that the apron would have looked cleaner without the plastic fins. The front fender gets a slashed out design. The internal side of the front apron has been designed in a boomerang shape. The shape brings the handlebar close to the rider while also providing enough knee room for the taller riders. The key slot and the choke lever flank the central spine of the front apron. Between the choke switch and the key hole, is a quick access hook which can be used to hang carry bags. Another hook is placed right under the rider seat which can be used to lock the handle of a purse or a hand bag. The under seat storage comes handy for storing a half face helmet or a hand bag. 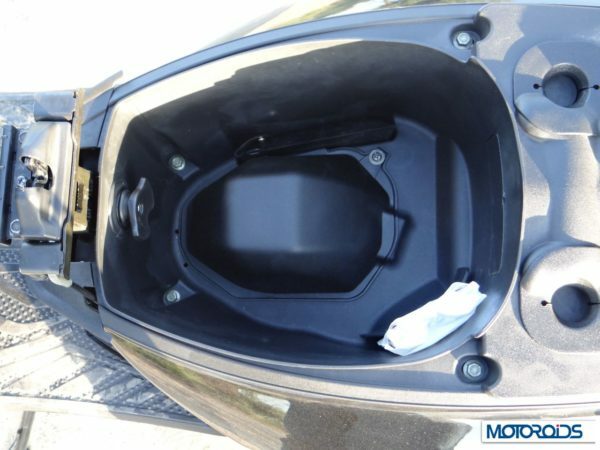 The seat, unlike other scooters, flips up from the front, with its hinges on the back side and locks at the full open position so users do not have to hold it up while accessing the storage space. The top end of the side panels have been squeezed inside giving the Gusto a more edgy look. This ridge under the seat, above the side panel travels all the way back to the tail light. 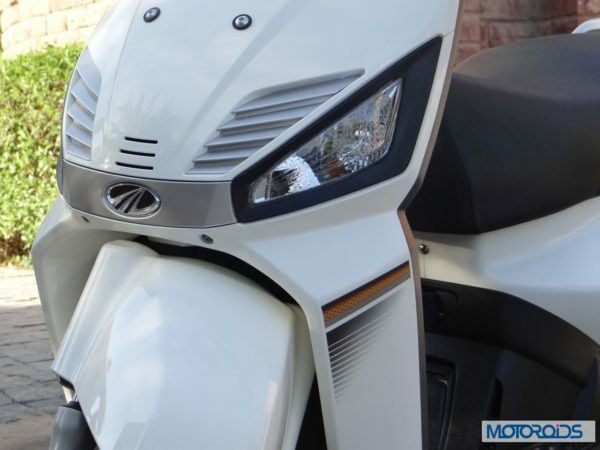 The side panels hold the Mahindra logo at the bottom, along with a 3D Gusto emblem in the middle adding to the rich and premium feel of the scooter. The exhaust, positioned below the side panel, also receives a black colored heat shield which does its job fairly decently. The silver coloured pillion grab bar, from the sides, is also shaped like a boomerang and stands out as a contrasting shade on all the colours. 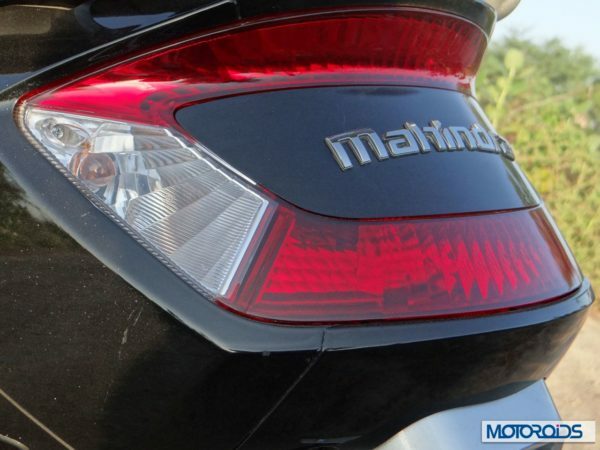 The big tail light surrounds the 3D Mahindra logo. The vertically stacked, curvy tail lamps are parted by the trapezoidal turn indicators. The rear reflector unit sits substantially below the tail lamp unit and is hooded by a silver housing. The instrument cluster is a conventional needle unit and a gets a silver nest. A Mahindra logo is embossed on the silver housing. 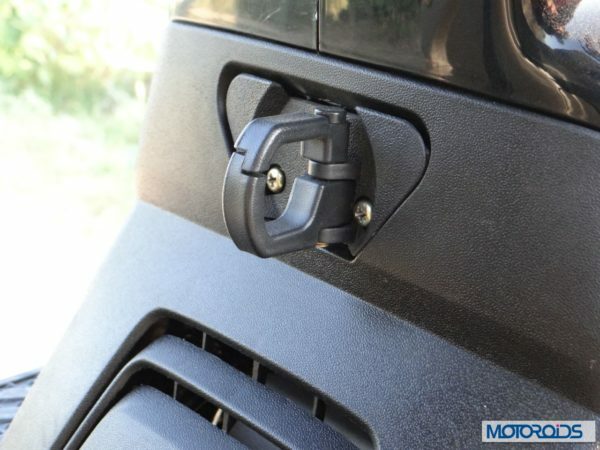 Just behind the instrument cluster, is a first-in-class quick access storage space which can be used to keep a mobile phone, keys or some money. The switchgear is at par with industry standards. 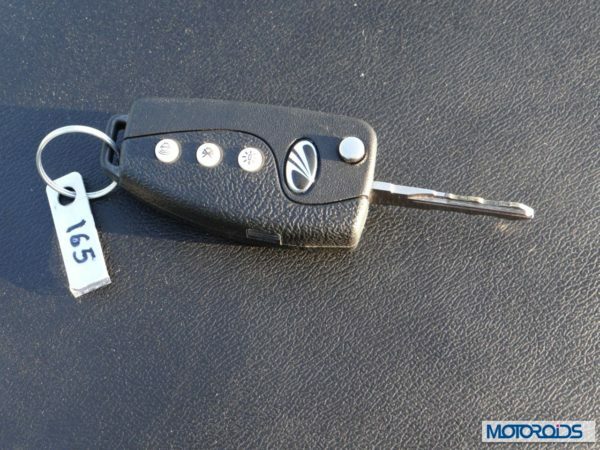 Another first in class feature is a Mahindra Centuro style flip key that comes as standard. The flip key comes with a ‘Find Me’ option. The Find Me option comes handy while locating the Gusto in a dark alley or parking space. Once you press the key, the alarm goes off which makes it easier to spot the Gusto in crowded parking and not so well illuminated places. The new Mahindra Gusto is a premium product in many ways. But despite the slew of premium first-offs, the new scooter misses out on a full digital or semi digital instrument cluster which would have been a great addition. Also, as we said earlier, the front apron could have been more appealing without the plastic fins which do not add any utility value. The tail-lamp also seems overtly big and busy – it could have been finished in a more sophisticated manner. The instrument cluster is an all analogue unit with silver housing. Behind the instrument cluster is a quick access storage space which can be used to store mobile phones, sunglasses or some money. The new Gusto receives a 109.6cc, all aluminium M-TEC motor that produces 8 HP of power and about 9 Nm of torque. The M-TEC engine comprises of a stronger crankshaft and bearings, high inertia magneto, high energy HT coil and series regulator which, Mahindra claims, would deliver superior power, efficiency and reliability. Pushing the ignition button makes you immediately realise that the engine is smooth in operation and if blindfolded, a layman might mistake it for a thorough bred Japanese motor. 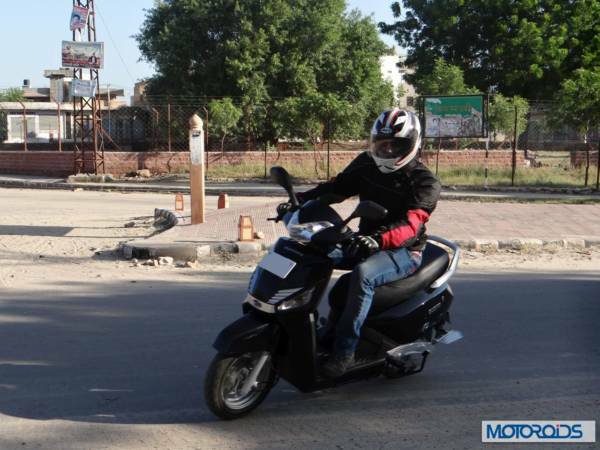 The engine feels peppy and gives the Gusto enough thrust to catch up with life in the fast lane as it felt comfortable even around the 70 kph mark. 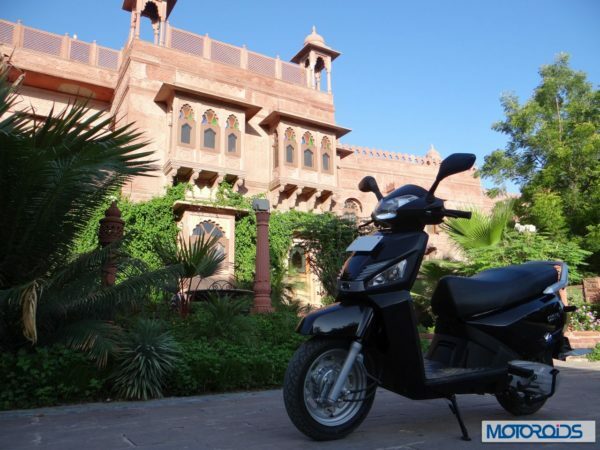 It has enough power in its kitty for city rides as well the odd hauls on wide, arterial roads. We managed to hit a top speed of 80 km/h on the speedo, which should be good enough for the kind of audience this new unisex scooter plans to address. 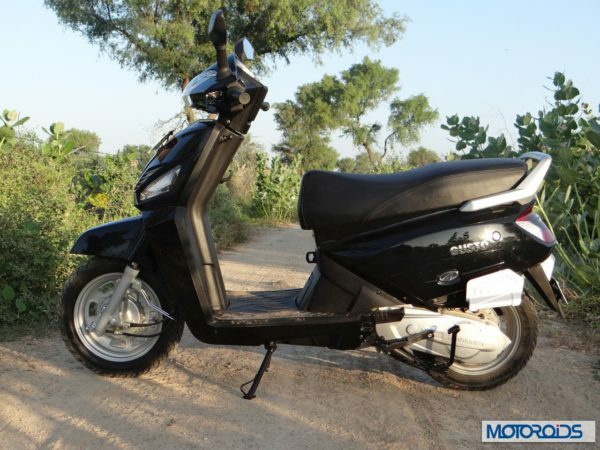 Adding a pillion to the scenario does not make world of a difference either and the Gusto offers good throttle response and reassuring acceleration for the humble purpose of commuting its meant for. What’s also unique in the engine is the new design of the kick starter. unlike the conventional kick-starter design on scooters, mounted way too far back and anti-clock-wide rotation, the Gusto features a pushed forward kick with clockwise rotation. 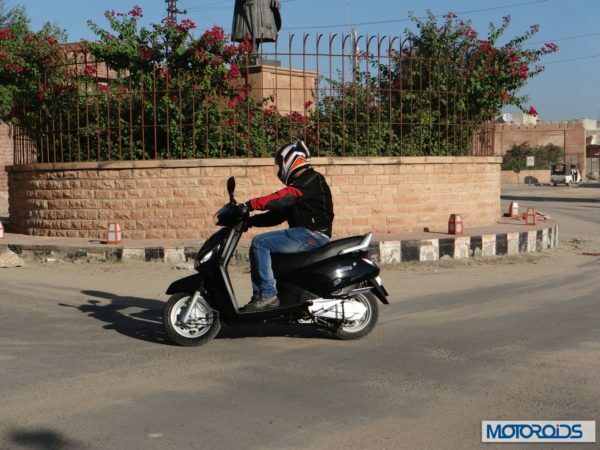 The allows the new scooter to be kick-started with the ride perched on the saddle, adding comfort and convenience. 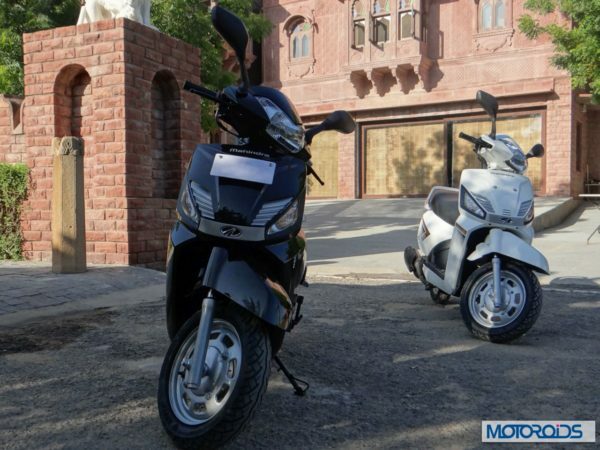 The Gusto, despite having a fun to ride engine, provides a good fuel efficiency, rated at 63kmpl as per ARAI. A larger than usual 6 liter tank should endow the Gusto with a decent range too. The stopping power is provided by drum brakes up front and at the rear, though an optional disc set-up for front would have been great. The riding geometry for the Gusto is well-sorted, thanks to the boomerang shaped front apron. Good ergonomics coupled with a long and well cushioned seat adds tremendously to the comfort. The seat cushion is neither too firm nor too soft and finds the right balance to ensure that the rider is comfortable even after an extended ride. Another first-in-class feature on the new Gusto is the height adjustable rider seat. 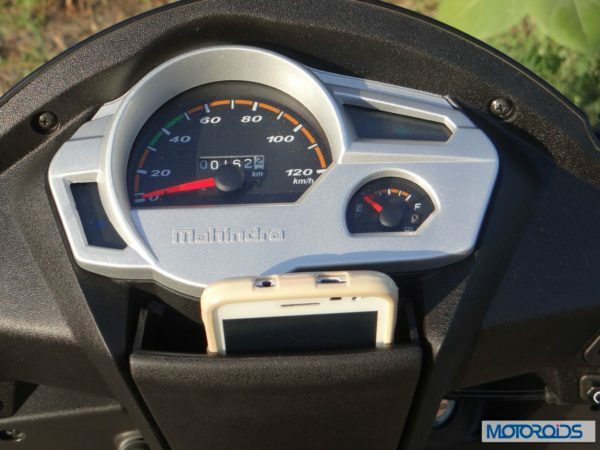 Mahindra has designed a lever underneath the seat which helps rider adjust the seat height according to his convenience. The rider seat can be adjusted by 40 millimetres. 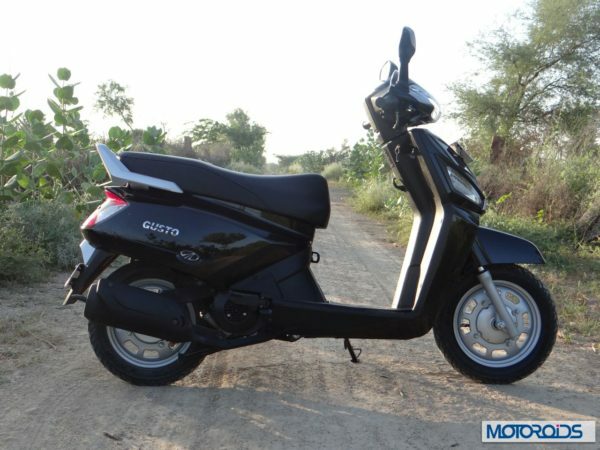 This provides more utility value to the Gusto as all the members of the family can use the scooter with ease. We rode the scooter for nearly 50 kilometres and thanks to the good blend of rider ergonomics, comfortable seat and soft suspension, found it very convenient for even long commutes. We rode the Gusto over a variety of terrain. The ride, having been organized in Jodhpur, presented to us a sandy, hot setting with fine dust working its bit to break traction. The front telescopic suspension and the damped rear spring worked well to offer a composed, sure-footed ride. Grip on the road is provided by 12 inch MRF Zapper FG 90-90 12 tubeless tyres, both up front and at the rear, which perform their duty rather well for all practical purposes. Even the sand-ridden, slippery roads were taken in stride with ample confidence. 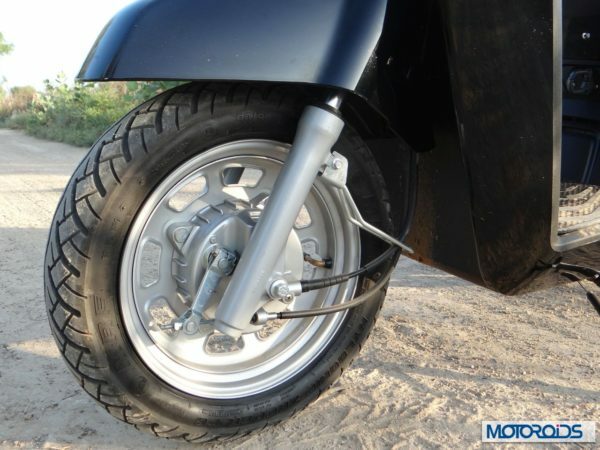 The 12 inch wheels, along with a well sorted suspension means that the Gusto absorbs even the more vicious patches on the road with confidence. It most definitely has a slight advantage over its immediate rivals as regards ride quality, and the generous ground clearance lets it sail over even the ill-built speed-breakers. Handling is good, with the 1275mm wheelbase adding to the Gusto’s stability. Even after beinhg slightly heavier than its counterparts, the Gusto is fairly easy to manoeuvre in traffic and you hardly notice those extra pounds on the scooter. 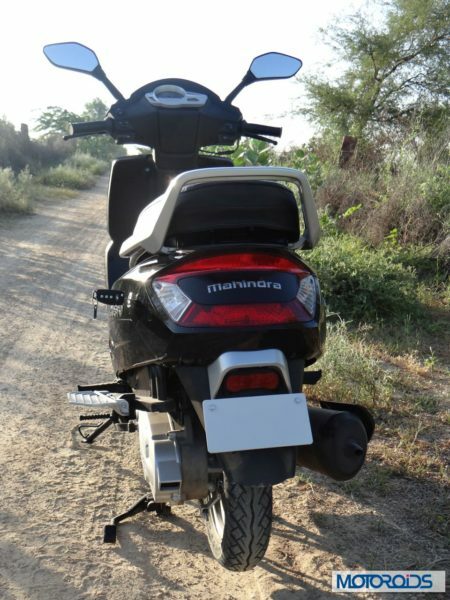 The Mahindra Gusto, in many ways, is a step-up from competition. The engine meets all the requirements of daily chores while the well-tuned suspension clubbed with the smartly designed and well padded saddle provides a comfortable city ride. The quick storage behind the speedometer is a good addition and we found it very handy while riding the Gusto. There is a scope for improvement in terms of underseat storage space and overall finesse in design, but those aspect, most definitely are not deal breakers. Features like an adjustable ride height, seat flip mechanism, convenient position of kick, guide-me-home lamps, flip key and quick storage are nifty additions to the package. 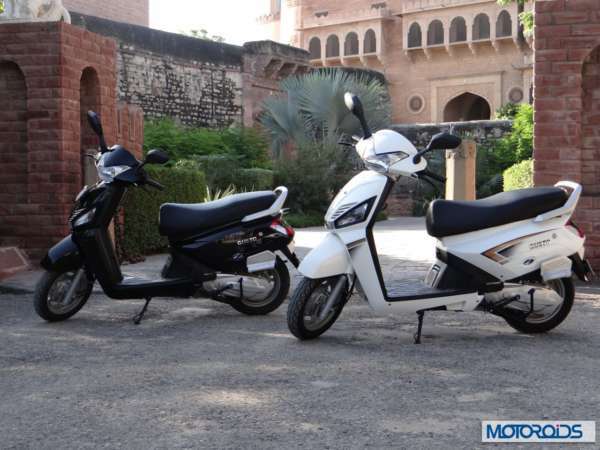 Mahindra have priced the scooter aggressively at Rs 43,000 (Base DX variant) and Rs 47,000 (VX variant). 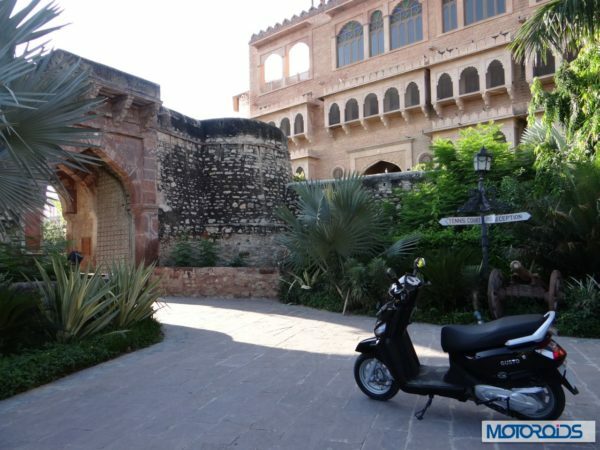 The pricing, going by the long list of features is extremely aggressive – making the Gusto worth taking a test ride before making any buying decisions in the entry level scooter segment. 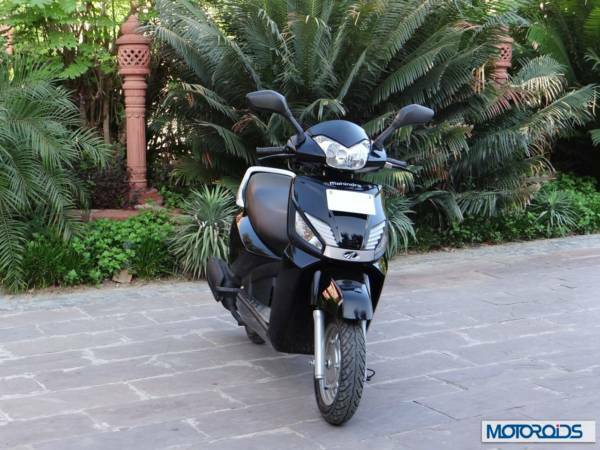 The Mahindra Gusto will be available in two variants and has been priced at Rs 43,000 for the Dx variant, while the Vx will be available at Rs 47,000, ex-showroom, Delhi.